I buy a lot of Indie bundles, so it’s no wonder that my Steam library is nearing 1000 games. But I also have a library of games on Desura that never made it to Steam, or worse, games that only exist as stand-alone installers (gasp)! I know, I know, those of you that consider digital distribution platforms a form of DRM are probably pretty happy with that .exe installer you were able to download, but personally, I like having all my PC games in one place: Steam. Unfortunately, due to an ever increasing number of competitors (Origin, Uplay, Battle.net, Glyph, Desura, GOG, and even Amazon), I’ll never have all of my games in one place, but when the opportunity pops up for me to add a Steam game to my library, I go for it. Well, it turns out, all of those Indie bundles I’ve collected over the years are not the same as they were the day I purchased them. The vast majority of them now include Steam games that simply weren’t there before. Maybe they were games that previously existed only on Desura or DRM free, or maybe they were games that were Greenlit on Steam at the time of purchase. It’s even possible that a couple of games were added to the bundles after I purchased them, and I just forgot to go back and retrieve keys for them. No matter what the circumstances, the fact is, Steam keys get added to Indie bundles weeks, months and even years after they go on sale. In any case, I just went back and manually clicked through every single Indie bundle I ever purchased. Between Humble Bundle, Indie Gala, Indie Royale, Bundle Stars, Groupees and Indie Game Stand, I found well over 50 Steam keys for games that somehow never made it into my library. I wish these companies would actually e-mail us when Steam keys get added! Either way, I’m glad I went back and checked. That’s pretty much all I wanted to say. I suppose to many of you, I am stating the obvious, but if you’re like me and you buy tons of Indie bundles, go take a look through your old ones, and get those Steam keys! 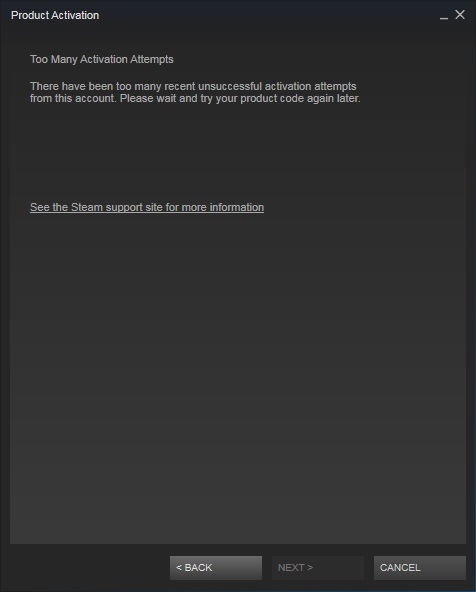 Oh, one more thing… if you happen to register more than 25 product keys in a short amount of time, Steam might give you the annoying message about “Too Many Activation Attempts” you see to the right. This message is a bit misleading, as you may encounter it without having any unsuccessful activation attempts. If you do get this message, just take a deep breath and step away from your computer for a little while. In my case, this happened to me twice during my Steam key activation marathon, and each time it only took about 10 minutes before I was able to continue entering more keys. Have a backlog problem? Check out Christian’s article about his simple solution.